I have always as a child had some special patterns when it comes to footwear. For starters I stopped wearing chappals at home every since I turned six. I have no clue how or why I did that. But over the years I have collected (and created) reasons through research that always end up selecting ‘being barefoot is a healthy way of being’. And now? Well now it is these red strapped Puma chappals that have found some very serious favor with my soul. It goes where I go, quite literally. And so much so that I have worn them under fancy cocktail dresses to even sarees at some functions. This has left people appalled, giggly and at certain instances also sympathetic (the kinds we save for the insane). In turn it has left me light spirited (again literally), always on the go and one too many times center of attention (all in my favor of course). But this isn’t about a random idea or irrationality, no? It reflects more. More of who I am, on the inside and this has been waiting to come out. These emotions I keep strapped underneath those red lines. Someone recently shared this thought with me through message. People are like shoes, we always first choose the good looking ones but in the end stick to the ones we are comfortable in. 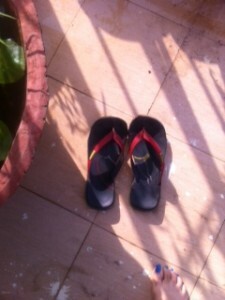 And instantly I looked at my puma chappals, safe and sound near the door adjacent to my bookshelf. They made a good couple, the kinds I would spend the rest of my life with. What is it really? Why am I so particular about this lonely odd seven hundred bucks chappals? Who are they to me really? Manufactured in a factory I will never visit and paid by money I never enjoyed earning. Tonight I guess I am in one of those moods. The kinds you regret. Of course. So lets dig deep. Ask again, why? Because I am scared, scared to try a new set of chappals and not like them. Afraid to give life and more importantly people a chance. In fact if you re-read the post you would realise these chappals are never the first choice, going barefoot is. Not selecting anything, allowing my inner-self to take course and withholding any sense of attachment to a particular option or thing in life is what comes most natural to me. In case that doesn’t happen I often stick to basics, not force myself too much space outside a set comfort zone. Yes all that I got from my ways with feet. See where yours take you. In fact you are most welcome to walk in mine for a while tonight, ponder on the idea I just presented before you here. What is your one idiosyncrasy that keeps surfing every now and then? And does it reflect something deeper in you as well?